Houston area officials are investing hundreds of millions of dollars into widening Interstate 45, and they could be paying much more for even larger upcoming projects along the corridor. But a comparatively-paltry sum is about to boost bike sharing in Houston in a big way. The same transportation improvement plan aiming $140 million at I-45 includes $4.7 million meant to expand the B-Cycle program in the city. The plan is set for discussion Friday by the Houston-Galveston Area Council’s Transportation Policy Council. 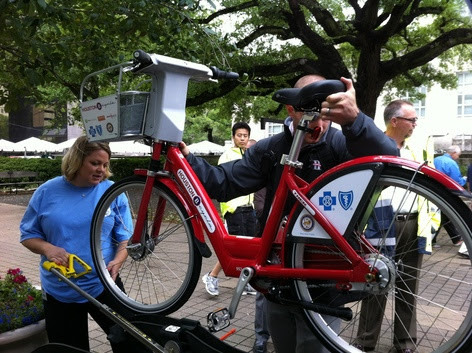 The money, including a 21 percent match from B-Cycle, will add stations in the Texas Medical Center and Rice Village in one phase, increase density in the downtown and Midtown area from the Med Center in another, before expanding east and southeast to EaDo and the University of Houston and Texas Southern University area. “By the time this is finished, our goal is to go from 29 stations and 210 bikes to 100 stations with 800 bikes,” said Will Rub, director of Houston B-Cycle. Having 800 bikes at Houston kiosks would build on what supporters have said is strong use of the bikes by Houston residents and visitors. From January to July, more than 60,000 bike checkouts occurred. The theory, following on similar reaction in Denver, is more stations and bikes exponentially increase use, provided the stations are where people want to go. See here, here, and here for some background. According to the Mayor’s press release, about $3.8 million is coming from H-GAC, and the rest is from B-Cycle, which as he story notes has generally covered most of its operating costs. Having more stations will make B-Cycle a lot more usable; I personally have had a couple of recent occasions where I needed to get somewhere on the edges of downtown from my office, but the nearest B-Cycle station was far enough away from my destination that it wasn’t worth it. Especially now with the rerouted buses and the new rail lines, expanding B-Cycle access will make transit that much more convenient as well. I look forward to seeing where the new kiosks go. The Highwayman has more. The Woodlands is growing as en employment center, which means it is also seeing a lot more traffic in what used to be the reverse commute direction. There is no longer a simple drive to this onetime bedroom community, which has turned into an economic powerhouse and upended the flow of traffic in the process. These days, it can be nasty in both directions during rush hour, with just as many people driving to The Woodlands for work as residents leaving for jobs in the nation’s fourth-largest city. The movement is unique in the eight-county Houston region, where commuters mostly have followed the same paths from the suburbs into the city for decades. The rapidly growing ranks of reverse commuters have created new challenges for those responsible for keeping the area out of gridlock. Houston Transtar data shows the 21-mile stretch from the northern edge of The Woodlands to Beltway 8 takes about 34 minutes on average at 6 p.m. – up from 21 minutes just four years ago. That’s in part because of road construction south of The Woodlands. But it’s also because there are more vehicles using I-45 than it was designed to handle. For example, the stretch between Rayford Road and Woodlands Parkway is carrying 253,000 cars a day, which is 18 percent over capacity, officials said. The Texas Department of Transportation expects some 390,000 vehicles a day to be passing through that stretch by 2030. Some people also worry about increased traffic within The Woodlands, with several high-rises sprouting in the town’s center, giving it a look that’s similar to Houston’s Galleria, a place where traffic routinely backs up throughout the day. One problem is a lack of options for those with the reverse commute, which has existed for decades in major metropolitan areas like Los Angeles and Washington that are ringed by mini-cities. For Houstonians with jobs in The Woodlands, though, there are no buses going their way, no park-and-ride lots and no high occupancy vehicle, or HOV,lanes for relief. The only alternative is the Hardy Toll Road, which can cut down on drive times but does nothing to reduce the number of cars making the daily trip to and from the suburb. That could change. The Woodlands is considering introducing bus service for reverse commuters. The township already provides express bus service for residents working downtown and at the Medical Center and Greenway Plaza. 1. Most of this is happening north of Beltway 8, where I-45 is six lanes wide – this is the portion of the freeway that has been improved by TxDOT already. There’s also three lanes’ worth of the Hardy Toll Road that can get you to the Woodlands. It’s not a lack of road capacity that’s a problem here, is what I’m saying. When TxDOT does whatever it’s going to do to I-45 between the Beltway and downtown, it will only get worse, just as I-10 inside the Loop got congested after it was widened out west. 2. It’s good to hear that the Woodlands is considering bus service from Houston into their township. There’s clearly a need for it. I would hope that they work with Metro on this, mostly to ensure there aren’t any egregious gaps where there should be overlaps. Ideally, they will work to integrate the two to extend the reach of their own service, and possibly save themselves some money on facilities. I’m thinking they should aim to have at least a few stations for their service at Metro transit centers, and provide a subsidy for for their riders to take a Metro bus or rail line to get there. 3. Ultimately, the only real solution here is going to be to get fewer cars to use the road. As we should surely have learned by now, adding highway capacity doesn’t solve highway traffic problems, and does a lot to exacerbate traffic problems on surface streets. More transit, more carpooling, more people living close enough to work to be able to walk or bike – all these things need to be in the mix. The idea that Something Must Be Done to enable you as a single-occupancy-vehicle-driver to get to work faster needs to be put to rest, because at some point that just ain’t gonna be possible any more. The sooner we all accept that, the better off we’ll all be. I think the problem is easy enough to identify. The solution is another matter. Houston-area transportation planners are considering some novel strategies – at least for Texas – for managing traffic to ease congestion on U.S. 59 between downtown Houston and the Sam Houston Tollway. Among the steps that may be considered are clearing accidents more quickly, restricting trucks to certain lanes and allowing buses to use freeway shoulders. First, though, planners are running ideas by the public. A variety of agencies, corralled by Houston-Galveston Area Council planners, have been discussing options for short-term fixes to U.S. 59 traffic. The puzzle regional planners are hoping to solve has one major constraint. “The approach for this study is not taking more right of way or adding more lanes,” said Bill Tobin, chief transportation planner for H-GAC. Using the same lanes more efficiently is a big challenge along the 14-mile stretch of U.S. 59. Officials estimate 300,000 vehicles use the freeway on an average work day. 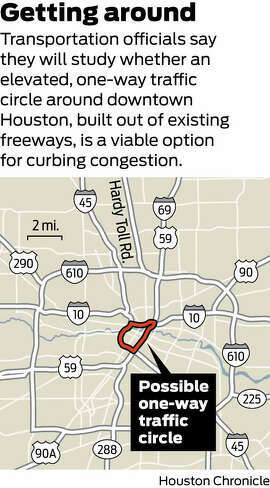 Often, Harris County Judge Ed Emmett said at a recent meeting, the congestion defies common assumptions. “It has baffled me for many, many years why inbound the Southwest Freeway backs up in the afternoon,” Emmett said, noting one would expect most traffic to be heading away from downtown jobs and back to suburban homes. All due respect, but I don’t think there’s anything to be baffled about. Heading northbound on 59, when you hit Loop 610 there are five lanes. At the downtown spur, north of Greenbriar, it narrows down to three lanes, as the two leftmost lanes peel off onto the spur. Then when you get to the I-45 junction a mile or so farther north, it squeezes down to two lanes as the leftmost lane is exit only. This is also the point at which 288 merges into 59, which returns to three lanes and stays that way till you get north of I-10. And this isn’t really “inbound” traffic in the traditional sense, either. It’s people heading from employment centers like Greenway Plaza and the Galleria, not to mention the Medical center for all those 288 folks, to the various suburbs via 59 and 45. It’s the same reason why 288 northbound backs up in the afternoon. What to do about it, I have no idea – the suggestions proffered are fine, though I doubt they’ll make much difference – but putting a finger on the cause is easy enough. Welcome to the wonderful world of transit. With help from regional officials, The Woodlands is entering the bus business, a decision that might give south Montgomery County commuters more options down the road. Population gains pushed the Woodlands-Conroe area from a “small urban area” to a “large urbanized area” of 230,000 residents for the 2010 Census. That bump means someone has to take responsibility for federally awarded transit money. “Now those dollars are coming to us,” said Nick Wolda, spokesman for The Woodlands Township, the local governing organization. With the money, however, comes responsibility for overseeing a bus system and stocking up on buses. To get the fleet started, Woodlands officials reached out to the Houston-Galveston Area Council, which doles out federal transit money in the Houston area. Council officials Tuesday approved a $14.1 million agreement that uses $11.3 million in federal funds and $2.8 million from The Woodlands to buy 25 buses over a number of years, starting with five in the first year. “It is not all the buses they need, but it is gives them a great start,” said Alan Clark, manager of transportation air quality programs for H-GAC. Controlling bus service in their communities means the township and city can adjust service more to their liking and move more quickly, Clark said. By owning buses – and potentially having the funding to invest in more lines – transit officials in southern Montgomery County can start to position the buses to meet the area’s explosive growth. I wish them all the best with that. They’re still going to have to deal with the fact that their lack of a street grid and the resulting traffic congestion will severely limit the utility of their bus network, but it’s a start. At least every bus passenger will be one less car on those crowded streets. It ain’t much, but it’s a start. 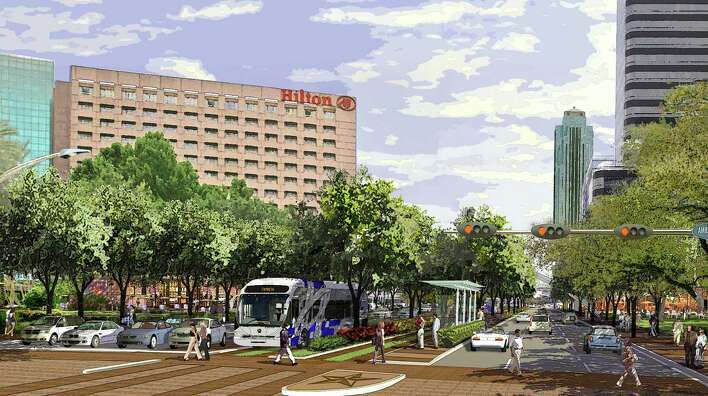 Plans for bus-only lanes along Post Oak Boulevard in the Uptown area moved forward Thursday when a key committee recommended spending $62 million in federal funds. Members of the Houston-Galveston Area Council’s transportation improvement program subcommittee approved the spending, a month after delaying a decision so staff could study the issue more, especially regarding plans for the buses to use lanes along Loop 610. In the end, after that additional analysis, planners found the project to build bus-only lanes along Post Oak and offer dedicated service between two park and ride lots is worthwhile, even without the freeway component. “This project would score exactly in the middle of the highest tier,” said Alan Clark, manager of transportation and air quality programs at the Houston-Galveston council. Two more approvals from a technical committee and the region’s transportation policy committee are needed for the project to receive the federal funds. Combined, the Westpark transit center and rapid transit project and Post Oak improvements are estimated to cost about $148 million. The work along Loop 610 is considered a separate $40 million project, which likely will follow the bus upgrades, set to open in 2017. See here for the background. H-GAC had wanted to get more technical input from TxDOT about the Uptown plan as a whole and in regard to the HOV service before signing off on the grant money. As originally reported, up to $45 million may be available, with that money originating with the federal government and being allocated by H-GAC. I’m not exactly sure where the $62 million figure comes from; perhaps it includes work related to the Uptown project but not for the work on 610. Their next meeting is June 28, and at this point I feel confident the grant will be approved. Metro’s Strategic Planning Committee got an update on the “Bike and Ride” Access Study. Metro says it wants to make it easier for Houstonians to combine bike and bus travel. Metro officials say between 10,000 and 15,000 people every month bring their bikes aboard when they use the bus. Every bus has a rack on front that can hold two bikes. Initial results of a survey by Metro and the Houston-Galveston Area Council show many more riders would like to bring their bike on a bus or train, but they don’t know how transit fits into their travel choices. Metro board member Christof Spieler says the goal of the study is to find ways to hook up bike trails with transit centers. I’ve discussed the bikes on trains issue before, and as noted in my first link remain hopeful that as the new light rail lines are completed and new rail cars are purchased that Metro will extend the hours in which you are allowed to bring your bike onto a train to include rush hour. 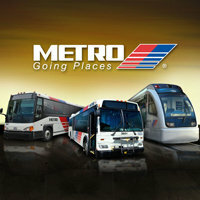 The figures monthly bike boardings on Metro buses is in line with what Metro had previously reported. It’s a non-trivial amount, but there is surely room for that number to grow. More train service, more bike-on-train hours, and better bus service should help with that. I don’t know if anyone has articulated a goal for bike-to-transit usage – 20,000 combined bike-on-bus/train boardings per month? Thirty thousand? Fifty thousand? – but we should have one, and we should have a strategy for how to reach that goal. I hope that subject comes up as Metro and H-GAC evaluate the results of the survey, which you can still take. The Houston-Galveston Area Council (H-GAC) and METRO invite you to participate in the METRO Bike & Ride Plan, a planning effort to improve connections between bicyclists and the transit network in the METRO service area. Take the survey! The METRO Bike and Ride Access and Implementation Plan will enhance METRO’s ability to provide first class transit service by linking the region’s expanding bicycle networks to transit infrastructure, while building upon its foundation as a trusted community partner to implement a prioritized set of projects that will provide attractive, safe, healthy, low-cost transportation choices for all users. The METRO Bike and Ride Access and Implementation Plan will define a prioritized set of high-quality links between the bicycle and transit networks in the METRO service area to maximize the ability to make bicycle-transit linked trips for all users. Again, the survey is here. I don’t know if there’s a deadline on this, but please take a moment if you can and help them out on this. Via Houston Tomorrow. Focus group dates are Wednesday, Dec. 5 from noon to 1:30 p.m. and Thursday, Dec. 6, from 5 p.m. to 6:30 p.m. The METRO Bike and Ride Access and Implementation Plan will define links between the bicycle and transit networks in the METRO service area so more people can easily use both bikes and buses or trains to get around. You must RSVP by calling Patricia Lawhorn at 832-681-2523, or email bikeandride@h-gac.com. Once you RSVP, you’ll be given the downtown location of the meetings. I presume they mean you must meet one of those criteria listed, since I think it’s logically impossible to meet all three. Be that as it may, if this is up your alley get in touch and help them out. 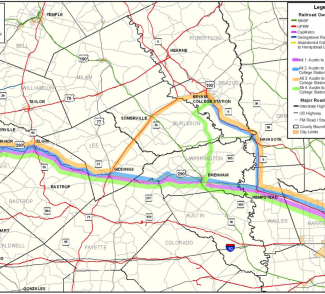 The Texas Department of Transportation presented results from a study on the potential for new 110 mph passenger rail service between Houston and Austin, potentially connecting College Station, according to Guidry News and documented in the minutes of the December 16 minutes of the Transportation Policy Council. – Austin to Houston directly ($972 million – 2hr 45 minutes). – Austin to Hempstead, with connecting spur service to Bryan / College Station ($1.255 billion – 3hr 51 minutes). – Austin to Giddings to Bryan / College Station to Hempstead to Houston (a little over $1.149 billion – 3hr 15 minutes). – Austin to Brenham to Hempstead to Houston, with a spur to Bryan / College Station ($1.213 billion – 3hr 38 minutes). All routes assumed two round trip options daily with one train each leaving from Houston and Austin in the morning and evening. All routes assume that they would not actually be a single ride between the centers of the cities, but would connect to commuter rail systems that some are advocating in each region to go from Austin to Elgin and Houston to a suburban location along 290. Details derived from audio of meeting, recorded by Guidry News (mp3). I recommend you look at that PowerPoint presentation, as it illustrates the different options discussed. I have to say, I find this all disappointing. The travel time, even for the direct route, is no better than driving, and I have a hard time seeing how this can be a viable, competitive option if you can’t get there any faster than you could have on your own. Part of the reason for this is the stops in between, in Elgin, Giddings, Brenham, and Hempstead, but mostly because the average speed of the train is not very fast; the Hempstead-Houston segment shows an average train speed of 50 MPH, which needless to say would feel like molasses if you were behind the wheel. I don’t know why that segment is projected to be so slow, I don’t know why they only refer to 109 miles of track when it’s about 150 miles between Austin and Houston on 290, and I don’t know where the “Houston” station would be located; neither, apparently, do they, which is in part what Art Storey’s quote is about. I like and support the idea of rail between Austin and Houston as I do between Dallas and Houston, but I feel like we would have to do better than this. Note that there are three alternate routes proposed as well, all of which go through Bryan/College Station. One of them bypasses Brenham, the others take a round trip to B/CS from either Giddings or Hempstead, which adds considerably to the total travel time; as such, none of these alternates are particularly satisfying, either. I hope there will be more to this than what we have seen so far. Bike advocates get a partial victory as the Transportation Policy Council voted to keep the last $12.8 million of unallocated federal funds on alternate mode projects instead of redirecting it towards roads. Ultimately, Storey voted with Harris County Judge Ed Emmett to funnel all the remaining dollars to mobility work, but leave previous funding decisions intact. A proposal by Houston City Councilwoman Sue Lovell to give $7.2 million more to bike and pedestrian projects and another $72.6 million to roads was voted down. CM Lovell put out a statement following the TPC meeting that said “This action not only stopped the loss of $12.8 million in federal funding recommended at the February 25 TPC meeting but also secured the commitment of the $51.6 million, which represents 15 percent of the total federal funding and exceeds the original recommendation that was originally considered by the Transportation Policy Council.” That is higher than the nine to thirteen percent range for alternate mode projects that Judge Emmett had recommended, but considerably lower than the 34% target that advocacy groups like Houston Tomorrow wanted. Still, they managed to reverse the original decision to use those remaining funds for roads and drew a considerable amount of attention to their efforts in the process, which is no small thing. I haven’t seen a statement yet from either HT or BikeHouston yet so I don’t know how they feel about this, but my guess would be more positive than negative. That postponed Transportation Policy Council meeting to determine how to allocate unprogrammed federal transportation funds happens today. A proposal before the regional Transportation Policy Council last month could have clawed back $12.8 million in funding set aside for bicycle and pedestrian projects and directed those dollars to road and freight rail work. At the urging of advocacy groups, the proposal was tabled to allow for more discussion. The TPC — an appointed body of mostly elected officials that directs federal transportation funding in the eight-county region — will take up the issue at its meeting Friday. 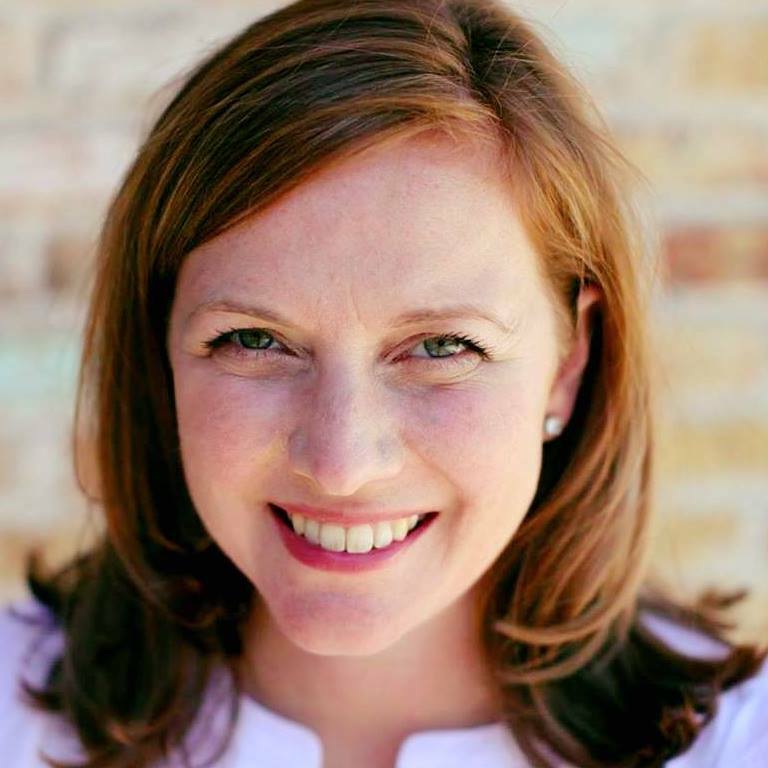 “I’m hoping we can reach a compromise to where all of the (bike and pedestrian) funding is not lost, yet certainly understanding the need for roadway and rail funding,” said Houston City Councilwoman Sue Lovell, a TPC member. In its 2011-14 transportation plan, the council has direct discretion over just $346 million in federal funds, $266 million of which already is allocated. Some TPC members have proposed setting percentage guidelines on how the remaining $80 million should be spent: 1 percent on planning studies, 9 percent to 13 percent for alternative modes such as biking, walking and mass transit, and for air-quality projects, and the remaining 75 percent to 82 percent on roads and rail. “I think there are going to be a lot of people in the broader community who aren’t in a particular interest group who say, ‘Wait a minute, of course, we ought to be giving 80 percent of mobility funds to actual mobility projects,’ as opposed to sidewalks or hike-and-bike trails,” [Harris County Judge Ed] Emmett said. Advocacy group Houston Tomorrow has suggested spending 55 percent of the funds on roads and rail, and 34 percent on alternative modes. They lay out their case here, with David Crossley adding more here. The meeting is this morning at the TPC’s office at 3555 Timmons, 2nd floor, room A. It’s open to the public, and the public comment period begins at 9:30, though there will be a TPC workshop beginning at 8:45 that you can also attend but not participate in. I look forward to seeing what happens. The Houston – Galveston Area Council Transportation Policy Council will host a public hearing to discuss citizen priorities for the use of discretionary funds in the 2011-2014 Transportation Improvement Program on March 25, 2011 at 8:45am at the H-GAC building in the 2nd Floor Conference room at 3555 Timmons. Houston Tomorrow has published a primer on the TIP funding issue. See here, here, and here for the background. I’m impressed by the amount of attention this has received. Take advantage of the opportunity to affect the outcome while you can. The Houston-Galveston Area Council’sTransportation Policy Council (TPC) unanimously voted on Friday morning to delay by thirty days its vote on a full $79.8 million allocation of unprogrammed federal transportation funds toward Mobility – roadway and freight rail – projects and a reallocation of $12.8 million from already committed pedestrian, bicycle, and Livable Centers projects to Mobility projects. The 30-day delay will allow the public and elected officials to further explore how potential money from the federal Surface Transportation Program Major Metro (STP MM) and Congestion Mitigation/Air Quality (CMAQ) funds should be allocated within the Houston-Galveston region’s2011-2014 Transportation Improvement Program (TIP). The decision came after elected officials heard from more than 20 business, bicycle, pedestrian, and political advocates in attendance, plus thousands of citizens who signed petitions and called officials’ offices during the week to voice their concerns regarding the manner in which federal funds were being distributed toward various transportation modes. Rather than push a vote through, City of Houston Council member Sue Lovell requested that the TPC delay voting on the issue for 30 days so that elected officials could more carefully examine the options on the table and hear from their constituents. See here and here for some background. Houston Tomorrow has an online petition that calls for roadway spending to make up no more than 55% of regional transportation infrastructure spending, which it says in accordance with the 2035 Regional Transportation Plan. I don’t know enough about the 2035 RTP to comment on that, but I am glad there will be more time to discuss this issue. A press release from CM Lovell about the requested delay to the vote is beneath the fold.